Radioactive atoms are unstable and spontaneously disintegrate (decay) into other atoms, releasing energy by the emission of ionizing radiation. When a positron-emitting radionuclide decays, the decay energy is shared between positron (β+) and neutrino (υe, which is not detected). The positron travels a short distance (positron range) in tissue before losing enough energy to be able to interact with an electron. This leads to the annihilation of the positron and electron, and two 511 keV gamma photons arise, travelling in approximately opposite direction from the site of annihilation. The emitted gamma radiation makes it possible to quantify and locate the radioactive material. The units of measured radioactivity (“activity”) are related to the rate at which they decay. The standard unit of radioactivity is Becquerel, and it is equal to one decay per second. An old unit is Curie, which equals to 37 GBq. Radioactive decay is a random process, and therefore the measurement of radioactivity must be treated with statistical methods. We have to observe a number of events (counts) with the detectors to achieve an acceptable level of fluctuations (standard deviation) of the mean value (counts/time). If the radioactivity in the sample is low, we have to measure it for a longer time, increase the size of the sample, or use a more sensitive detector system, to achieve sufficient count statistics. Temperature or mass can be measured repeatedly to determine the mean value and standard deviation with good accuracy. Also radioactive sample can be measured repeatedly, if there is radioactivity left, and if the sample otherwise does not change. But radioactive in vivo sample can be measured only once - as the sample itself is changing. Event is a generic term referring to the PET scanner’s detection of a gamma ray. There are four types of events: prompt, delayed (or random), true, and multiple. The result of radioactivity measurement is the number of detected events (counts) per measurement time. This is much lower than the number of actual disintegrations during that time. Detection efficiency is different for each detector system (and changes over time, is affected by humidity and temperature, etc). Therefore all radioactivity measurement devices (PET scanners, well counters, dose calibrators, blood on-line detectors, …) need to be cross-calibrated using a sample with known radioactivity. Cross-calibrations provide us with calibration coefficient for each device, which are used to convert the device-dependent counts/s values to comparable Bq values. Sample size is taken into account in the calibration process at the latest. The “activities” that we actually are using in PET data analyses are concentrations of radioactivity: Bq/mL (millilitre = cubic centimetre) or Bq/g. Accuracy of scanner calibration could be monitored by comparing image-derived blood or urine (bladder) activity concentrations to those measured from blood or urine samples (Maus et al., 2014 and 2018). Arterial cannulation enables fast and accurate blood sampling for obtaining the input function for quantitative data analysis. Sample tube is weighed before and after blood sampling, and placed in a well counter, where the radioactivity is measured. Measurement time may be automatically adjusted to achieve sufficient count statistics. Background radioactivity is corrected. Then the physical decay that happened during the radioactivity measurement of the sample can be corrected precisely. Radioactivities are also corrected to the time of radioligand administration, and calibrated to units kBq/g or kBq/mL. Radioactivity of plasma samples is measured similarly, except that weighing the tubes is not necessary, if a known plasma volume is pipetted from the blood to the sample tube. 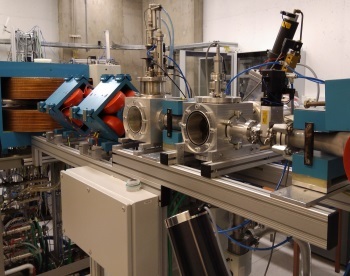 When blood radioactivity is measured using automatic online sampling system, the blood is flowing through the tubing at a certain flow rate, passing the detectors. Thus it is not possible to measure exactly same blood sample for a certain time, but instead we have to integrate the counts during a pre-set time “frame”, usually 1 or 5 s, that is required to achieve sufficient count statistics. Thus the sampling frequency is limited by the count statistics. The sample time has to be corrected for the time that it took for the blood to flow from the artery to the detector. In in vivo study the concentration of the radioligand in tissue is changing over time, but because of the statistical nature of the decay process we can not take a “snapshot” of the tracer concentration at a specific time point. Instead we have to integrate the events (counts) over a certain time “frame”, that has to be long enough to achieve acceptable count statistics. If counting statistics is not sufficient, the resulting image will be noisy, and even biased concentration values, depending on the image reconstruction method and parameters. If the time frame is long compared to the rate of change in tissue concentration, we will lose some of the kinetic information in the data, which may lead to biased results, depending on the analysis method (Raylman et al., 1993). Accurate solution of compartmental model ODEs requires short sampling intervals. Yet, AUC from time frame data can be correctly calculated, independent on the frame length. As the radioactive isotope is decaying and the radioligand is flushed from the organ of interest, the duration of PET “frames” need to extended to achieve sufficient counting statistics for each concentration measurement. New PET scanners store the data in list mode files (listing each event time and detectors that observed it), which enables us to re-reconstruct the images with different time frames, and thus testing the effect of the frame lengths. The optimal framing should be determined after the first pilot studies. If new image reconstructions are requested later for a large set of studies, the data recovery and reconstructions will be very time-consuming. After image reconstruction and calibration, the PET image will contain the time course of the radioactivity concentration (TAC) in each image voxel (in units Bq/ml). The limited image resolution of PET systems leads to partial volume effects, which can cause substantial under- or overestimation of the radioactivity concentration in a small lesion. With new scanner generations and advanced image reconstruction techniques, these errors will decrease. This also means that previously set cut-off limits in diagnostic studies need to be redefined, and that scanners and reconstruction methods need to be standardized in multi-centre studies (Kuhnert et al., 2016). Hoffman EJ, van der Stee M, Ricci AR, Phelps ME. Prospects for both precision and accuracy in positron emission tomography. Ann Neurol. 1984; 15: S25-S34. doi: 10.1002/ana.410150706. Lodge MA, Holt DP, Kinahan PE, Wong DF, Wahl RL. Performance assessment of a NaI(Tl) gamma counter for PET applications with methods for improved quantitative accuracy and greater standardization. EJNMMI Physics 2015; 2:11. doi: 10.1186/s40658-015-0114-3. Sitek A: Statistical Computing in Nuclear Imaging. CRC Press, 2015, ISBN 978-1-4987-2930-7. Teräs M. Performance and methodological aspects in positron emission tomography. Annales Universitatis Turkuensis, D830, 2008.